Altronix has expanded its Trove Access and Power Integration Solutions series. New additions to the Trove series include Altronix integrations with Bosch, DMP, Honeywell, Kantech and Sielox access. These new models join the line of Trove solutions which accommodate AMAG, CDVI, HID/Vertx, KABA/KeyScan, Mercury and Software House access controllers. 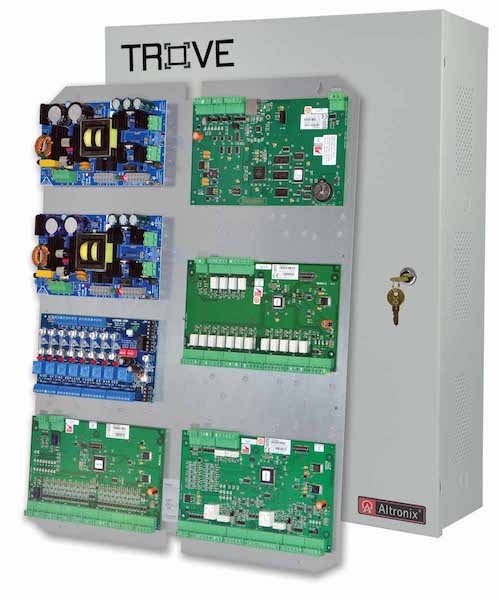 The Trove2 Access and Power Integration Solutions are designed for larger applications and allow Altronix power/accessories combined with access controllers from manufacturers to be wired and pre-tested prior to on-site installations. Meanwhile, the Trove1 Access and Power Integration Solution, a more compact version of the Trove2 for smaller applications, accommodates CDVI, HID/VertX and Mercury access controllers. All Trove enclosures include a cam lock, tamper switch and mounting hardware.